Layers would not have been possible without the contribution of my dad (St. Clair Software), who has fostered my love of programming and problem solving from an early age. His help and expertise allowed me to tackle design issues ranging from networking and threading to UI design, and has helped make Layers a solid and efficient application. I would also like to thank Next Level Media for hosting the Layers website! My name is Ben Gotow. I'm a Mac programmer, web developer and photographer, and a senior in Computer Engineering at Vanderbilt University. A little over year ago, I wrote and released my first app for the iPhone. A collaborative drawing tool called NetSketch, it allowed multiple people to draw back and forth between multiple iPhones. It was available when the App Store went live and sold well, but the online forums were quickly filled with comments from professional artists trying to do more than doodle with their friends. Several key features - the inifinte canvas, EPS export, and online replay capability - lured artists but left much to be desired. I tried my best to improve the app based on their suggestions: several months and four updates later, the app had been transformed to offer a more stable vector art solution. Unfortunately, the vector drawing model made some of the most requested features - custom brushes, transparency, and layers - impossible to add. The iPhone simply wasn't fast enough to do everything. After unsuccessfully trying to add custom brushes to NetSketch, I decided to build a new app from the ground up to provide professional-grade drawing tools. Four months and 22,000 lines of code later, Layers was submitted to Apple for approval! 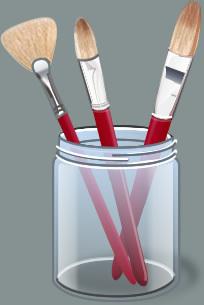 It offers a balanced set of painting tools, layers, and an intuitive interface to boot! I fine-tuned the app using the feedback from the hundreds of mobile artists who bought NetSketch and an extensive pre-release beta program. I think you'll like it - be sure to leave your comments in the forums!